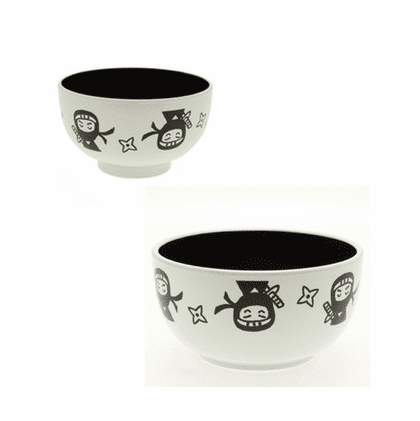 Black Ninja Soup Bowls, 4" or 5"
Home | Children's Serving Pieces | Black Ninja Soup Bowls, 4" or 5"
Black ninja character soup bowls. A ninja carries sharp, star-shaped discs which are known as shuriken and the shorter sword on the back as the Ninja's weapons. $7.95 each, #240151, 4" in diameter and 2-3/8" tall. Holds 5 ounces. $8.95 each, #240155, 5" in diameter and 2-1/2" tall. Mini donburi bowl holds 8 ounces.